I think every good parent worries about their child every time they strap their baby into a car seat. Despite that worry in the back of my mind, it always makes me feel a bit better knowing that I have done the best I could do by providing the safest car environment possible for my kiddo. 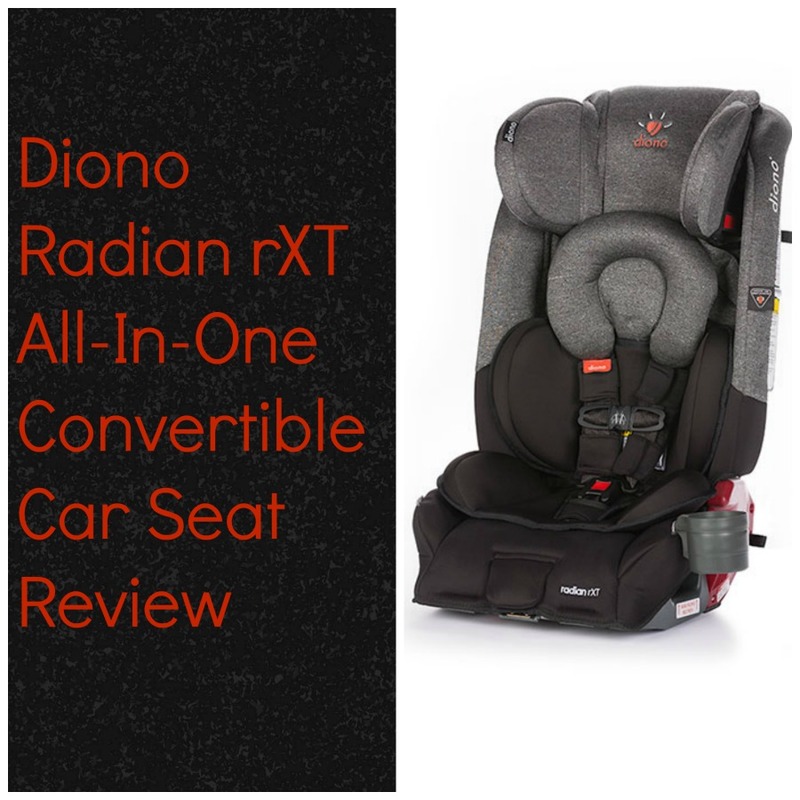 So buckle up and let’s talk about the Diono Radian rXT All-In-One Convertible car seat! As a disclaimer I am going to state that I am only reviewing this car seat, not demonstrating how to install or configure it. This is because it is crucial for everyone to read their car seat’s manual thoroughly themselves as that will ensure that the car seat is installed properly for their specific car and child’s needs. Now that that’s out of the way, here we go! When your Diono arrives in the box, it will be in its special folded configuration. It is easy to fold and unfold, which is great because the Diono is actually quite heavy due to its steel alloy frame. In the folded position the car seat is much easier to carry! Before I could use the Diono Radian rXT, I had to purchase the Diono Angle Adjuster separately. As it turns out, the Diono car seat is actually rather long, especially when it is in the rear-facing position. I have a hatchback and could literally not fit this car seat into the back without moving the passenger seat all the way up. Now, I don’t know about your spouse, but my husband needs his leg room! I couldn’t even drive with the passenger seat all the way up regardless of if my husband was there or not because I am tall and the passenger seat was obscuring my view. 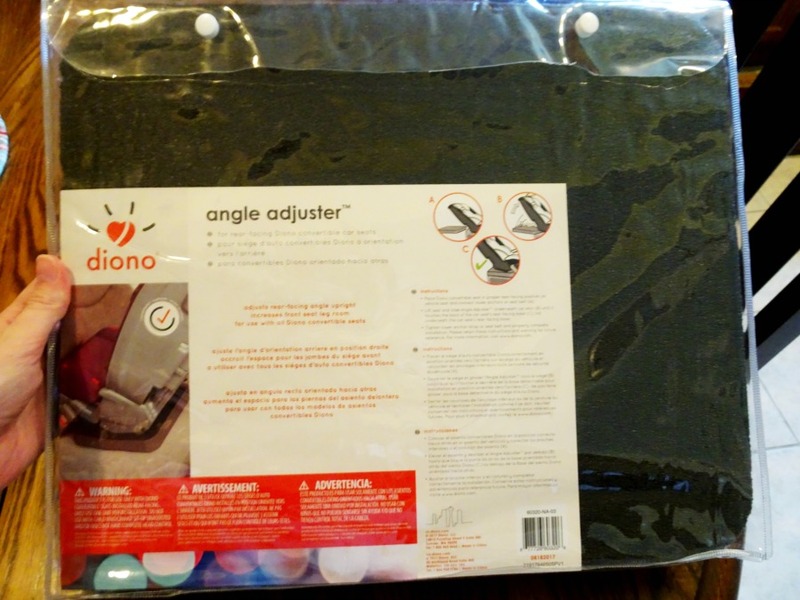 I was shocked that the Diono did not already come with this angle adjuster since it is marketed as an all-in-one convertible model, but I purchased the angle adjuster for around twelve dollars online. 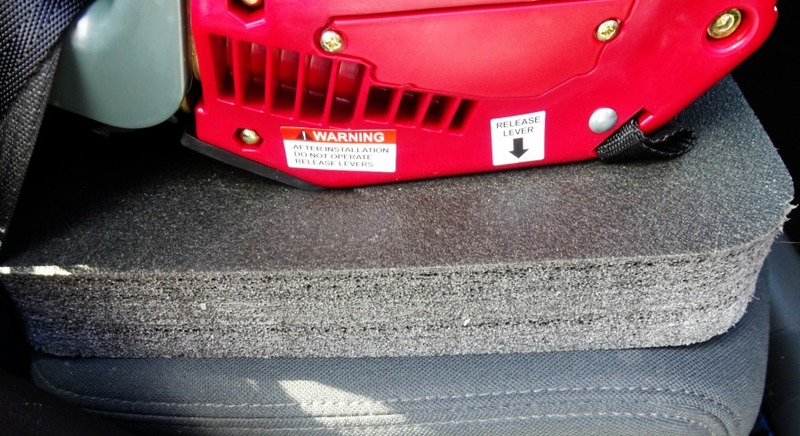 It is a foam block that you slide under the car seat which magically gives you a good four inches of space between the Diono and the passenger seat. It worked like a charm and now the passenger seat can go back to its normal setting! The Diono Radian rXT color that I chose is called Essex and I think it looks rather nice in my car. I think the aesthetic design of the Diono car seat is great and makes it look sleek. The cover is machine washable as well! This car seat has the ability to add up to four cup holders, two on each side, but the box only comes with one. 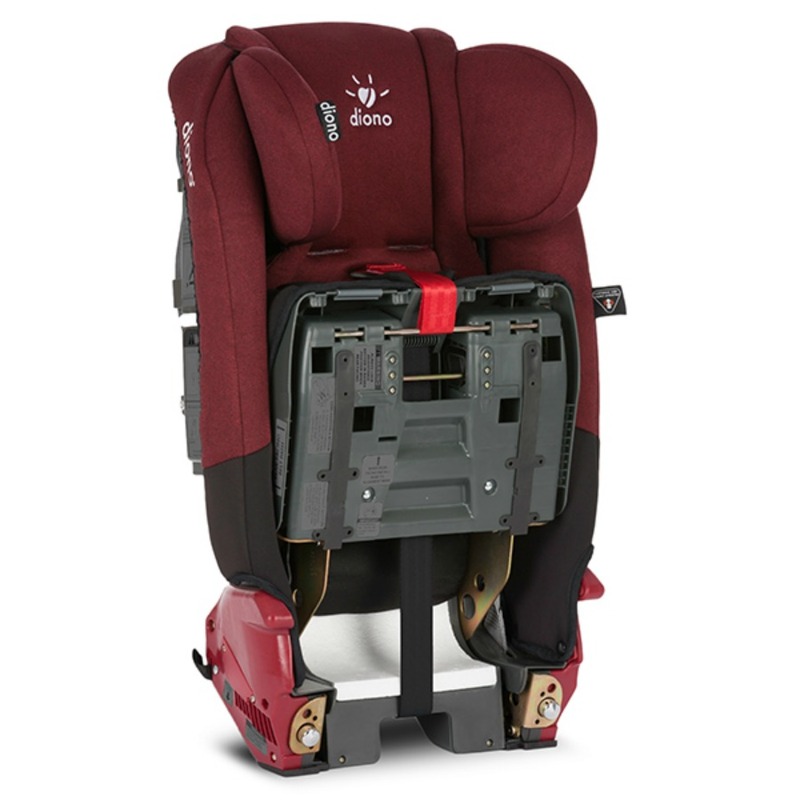 The Diono Radian rXT is also a very narrow car seat and can fit a row of three all together. If you have a large family with kids all in the car seat stage, Diono is about the only car seat on the market that can fit three side-by-side seats! 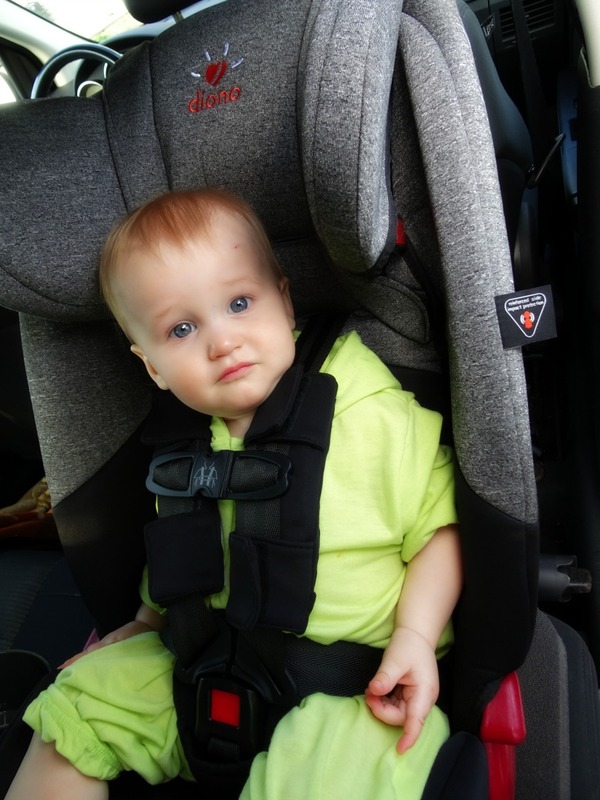 Because of the long and narrow nature of the Diono Radian rXT, tethering the car seat is absolutely imperative. When I tested the car seat for movement at the base, it barely budged. Yet when I tested it from the top, it moved far more than the recommended inch! If your car does not have a built-in tether ring (mine doesn’t) Diono provides a D-ring that you can slip around the bottom of your passenger seat base. You can then tether the car seat to the D-ring which ensures that the car seat will be extra secure. The Diono Radian rXT also comes with the superLATCH system that you can use instead of your belt if you wish. I used both so I could test which one was easier to use. 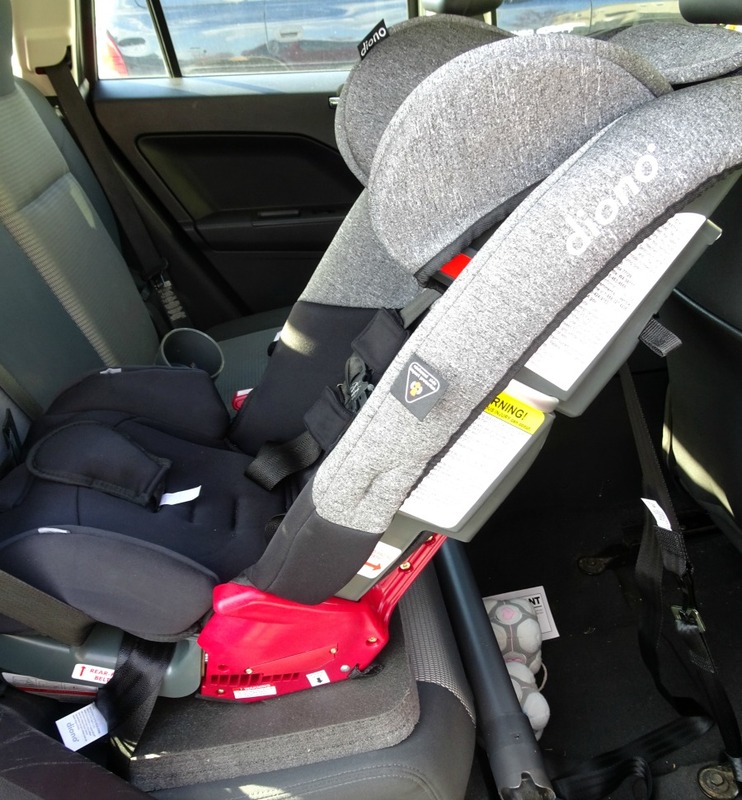 It turns out that they were both extremely easy to use because the belt path is by far the SIMPLEST belt path in a car seat that I have ever encountered! It was super easy to thread the latch system and the seatbelt through, even at the same time. I was very impressed by that! 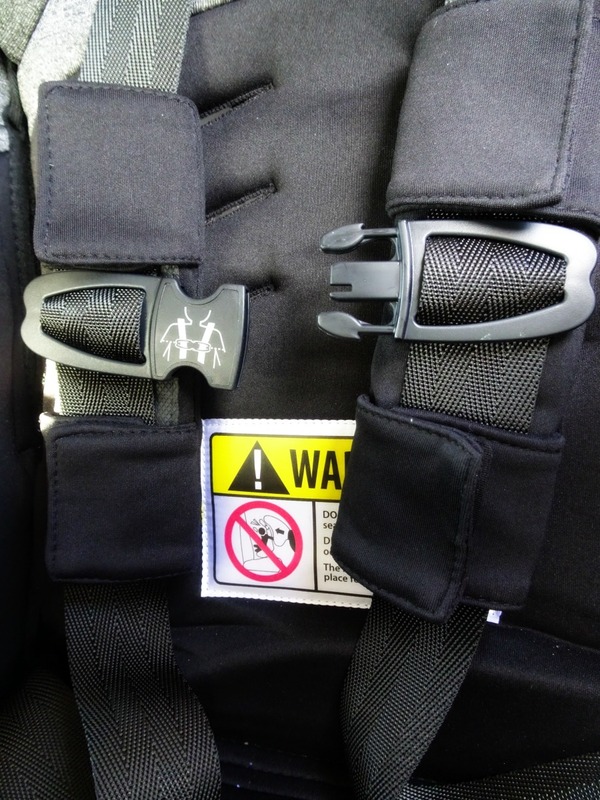 The Diono’s harness is probably my favorite feature because it has Safe Stop technology that uses a load-limiting device to absorb energy in the event of a car accident. The pads provided for the harness have been inserted with EPS (energy absorbing) foam and are soft while still being firm. I thought my son might be bothered by them, but he doesn’t mind them at all! Let me really quickly say that after taking these photos I have moved the car seat harness straps down closer to my son’s shoulders as this default setting was still a bit too high for him! It won’t be long before I will have to move them yet again though, which brings me to the convertible features of the Diono Radian rXT. You definitely get more bang for your buck when you buy a convertible car seat because it will grow along with your child. Our other car seat is also an all-in-one and we are so thankful that we went that route! 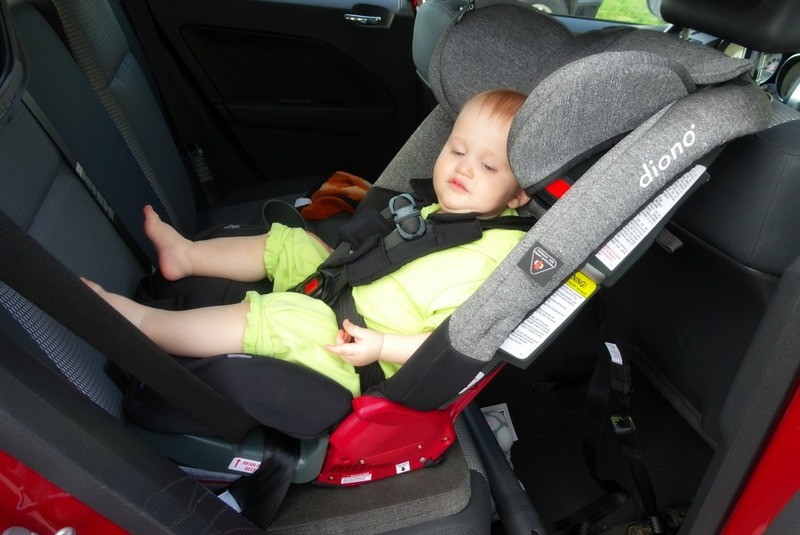 The Diono Radian rXT can be used with a newborn all the way up to a booster for older children. It comes with an infant insert for young babies and a booster attachment for older children, so no need to purchase additional parts for those conversions. The Diono truly grows with your child! My thirteen-month-old had no complaints at all about this car seat and has been a very happy camper indeed! My name is Jo Anna! I'm mama to my baby boy Tidus Harrison and wifey to my wonderful husband John. When I'm not cleaning or entertaining my baby, you could find me reading, writing, searching for vintage clothes, hiking, playing video games, cooking, day dreaming, crafting, or binging shows on Netflix. I am a huge nerd - a big fan of things like Disney, Star Wars, Harry Potter, and The Office. 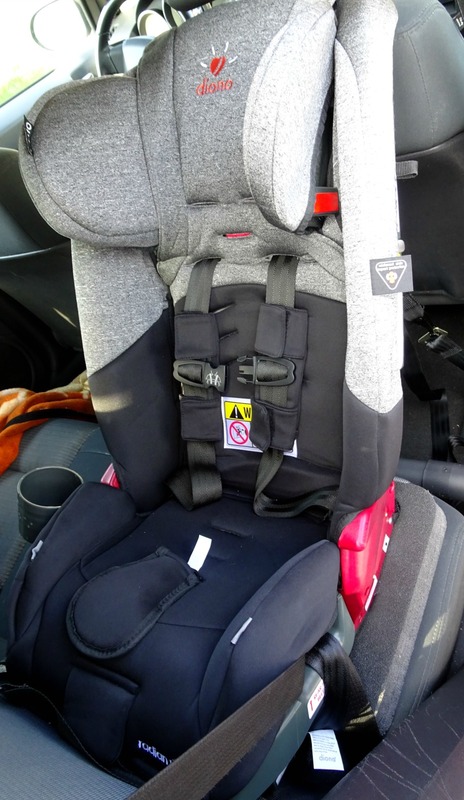 This Diono Radian rXT Car Seat does look amazing! I’d try to make sure I had it installed by a pro, and also get any help to know how to be careful. This is one I’d want to check out for sure! That’s very smart! I utilized their youtube instructional videos as well as their manual, which was quite helpful. This is a really nice seat. I want to get our grandson one. The Diono Radian rXT is a great model for sure! Especially since kids grow so quickly! Your grandson will love it!